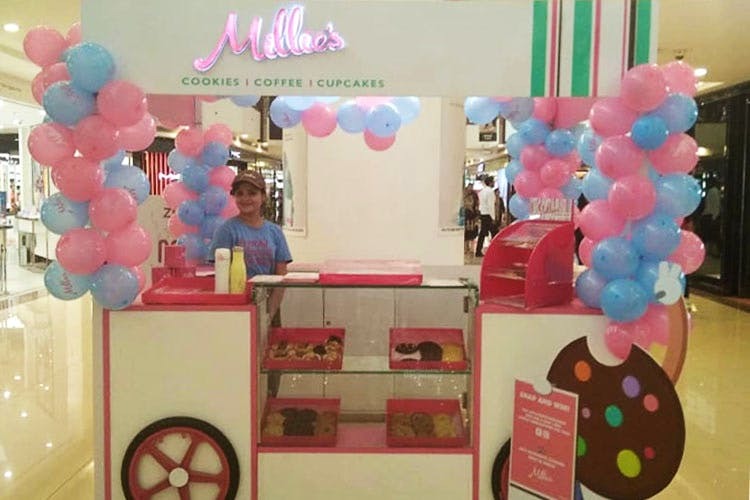 Millie's Cookies, a sweet, white-and-pink cart on the ground floor of Select Citywalk mall, is a nice place to grab a soft-baked cookie, or a milk shake on the go. The fact that they do good, soft-baked cookies. Very few places can. For people who prefer them gooey and soft to crisp and crunchy, this place is a Mecca. We tried the dark chocolate chip cookie and the double chocolate cookie (you can get cookie combos of two at INR 150 a pop). We preferred the dark chocolate one, but both were soft, gooey and perfectly sweetened. We also asked for a salted caramel shake, which took them about 10 minutes to produce (the kitchen is outside, and obviously not in the miniature cart setting itself). It wasn't bad, but the cookies definitely won over it. Things that we're excited about trying next time include the cookie pops, their Specialty Cookies (think Oreo and Twix) and the giant cookie (twice the size of a face). More options would be fantastic. They could also experiment a little more; all the cookie recipes are classics. Budget extra time if you're ordering anything on the menu that's not on display.